Sport on Saturday: Why women's rugby league is making history. 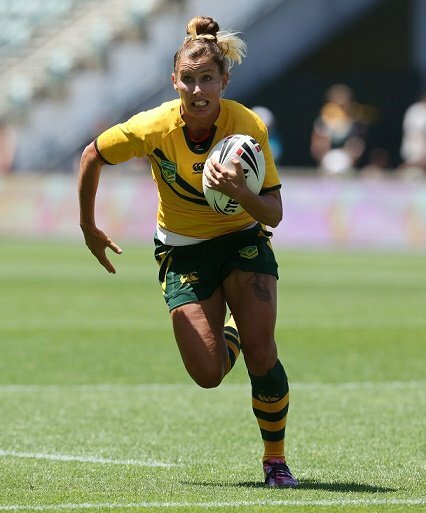 Stephanie Hancock, captain of the Jillaroos. Rugby league history was made on Sunday. And before you bolt because the thought of football makes you yawn, hear me out. 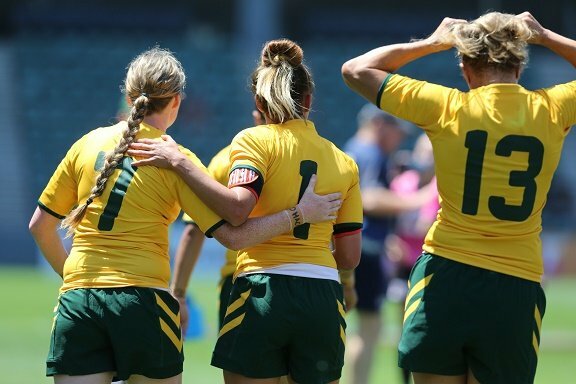 Last weekend, the Australian women’s rugby league team (the Jillaroos) became the first ever women’s team to be paid for playing in a test match. They got $37, 500 less than the men’s team, but it’s still breaking all records. The game on Sunday was one of the biggest in women’s rugby league history for other reasons too. It was the first clash between Australia and New Zealand since the Jillaroos had beaten the Kiwis to win the World Cup in July last year. And the game was a precursor to the men’s Australia versus Samoa Four Nations Rugby League match. The women’s game was live streamed on the NRL website and 16, 000 people viewed it. An impressive crowd of 8,000 fans trekked to the stadium to watch the girls live. These figures are huge – and they’re only going to get bigger as the women’s rugby league begins to really take off in Australia. 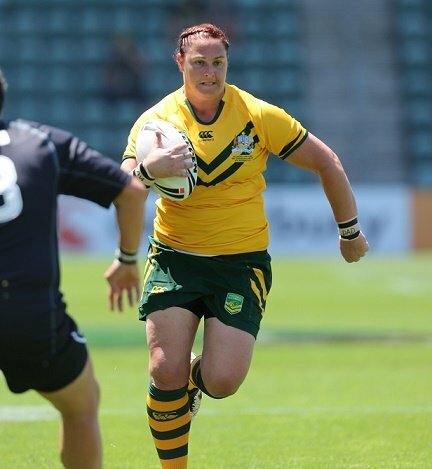 I chatted to Women’s rugby league captain, Stephanie Hancock, to find out how she got into rugby league, the support she gets from her family and what male rugby league players can learn from the women. S: Why did you first want to get in to Rugby League? STEPH: Mainly because I grew up watching dad’s old tapes and watching him playing origin and on the Kangaroo tours, (Dad is Rohan Hancock who played Rugby League for Australia and Queensland). As a little girl I always went to the local footy and started playing with my little brother Josh, which turned into me playing for the under seven, eight and nines. In 2003, I organised a women’s footy game at Killarney (in Queensland) and we had the biggest crowd Killarney Rugby League had seen for years. We managed to raise $10,000 and invested from there. I did have to talk mum into letting me play and she eventually agreed, which took a while as I was always her little girl. Last week I was made captain of the Jillaroos which was a really important moment for me. Mum and Dad came down from Queensland to watch me play. They drove 13 hours to Sydney to watch the game. Afterwards they came into the dressing room, kissed me and then they drove back. S: Is it as rough as we think it is? STEPH: I have seen a fair few injuries, so it is pretty physical and can be rough, but it is important to understand that there is still a strategy to the game. It’s about playing the best game of rugby league you can. It is physical and it is hard, but the pace is also fast and we seem to be getting faster each time we play. S: What’s it like being a woman in such a male-dominated sport? STEPH: Rubgy league is so broad now. Girls play it at school, there are different levels of contacts and different career paths. I grew up at the footy, with dad playing, my brother playing and eventually me playing. Mum helps at the canteen, it would be hard not to get involved. You find the boys are as interested in watching the girls as we are in watching them play every weekend. S: There’s a lot of media coverage on male rugby players. Do you think if there were more women in the sport, and you got more coverage it could change some of that culture? STEPH: As a team we try to make sure we are as professional as we can be on the field but it is a physical sport. We spent a week at camp with the men’s Australian team recently (the Kangaroos) and it was a really good time to share stories and learn from each other. Since 2013 leading in to the World Cup our media coverage has been pretty good. Social media has been really strong too. People are beginning to know who we are. I think that as the sport progresses we all have the chance to learn from each other. The women have resilience and strength of character. S: What could the men’s Rugby League learn from the women? STEPH: It’s a great opportunity for both men and women to learn off each other. Last week at camp we were able to swap tips and training ideas and broaden the perspective on both sides. I think they can learn resilience from women both on and off the field and strength of character. It’s a discovery journey for both. S: How was the game against the Kiwis last Sunday? STEPH: We are pretty disappointed that we lost but there were positives. I think we could have put more pressure on ourselves. We wanted to win so the Kiwis knew our World Cup win wasn’t just a one-off. It’s not always about winning but we have reflected on the loss a lot. We are not making excuses but it makes us more determined to beat the Kiwis. We have the Nines ahead and we will be ready. S: You got paid for the test match. How did that come about? STEPH: It’s a great progress for the game, the Jillaroos now sit under the representative department at the NRL. It was a big deal for everyone and things look brighter every time we play. S: How do you think that will affect the players? STEPH: It was big deal for everyone especially for the girls that have been involved for the past ten years. It is still important to remember that we play for the love of it to be honest. We are glad to receive the recognition but at the end of the day it is about our love of footy. I’ve had to pay a fair bit out of my own pocket over the last decade but I wouldn’t change a thing. S: You beat NZ for the first time in the World Cup last year – how did that change women’s rugby league in Australia? STEPH: The feedback was great. Since 2013 and winning the World Cup the changes keep coming. We have a lot more kids knowing who we are. The players know who we are and the Jillaroos are starting to be recognised as a national team. People know me as the prop that played for Australia now. When I got named captain the other day my phone went crazy, my social media has been crazy and everything has changed. We had 16,000 people watch us on the NRL website, it’s amazing. S: Where do you see the future of the Jillaroos going? STEPH: The only way is up. – The schedule for the 2015 Women’s Ashes series between England and Australia has been announced. The series will include a test at Canterbury, three one-day internationals and three Twenty20 internationals. The series is set to start on 21 July. All seven matches will be broadcast live on television (but sadly not free to air), which is a first for women’s cricket. They will be broadcast across Sky Sports and BBC Radio. – The Young Matildas have qualified for the U-19 AFC Championships in China next year. They secured their spot on Sunday night after taking out victory over Vietnam 3-0 in Hanoi. – The Hockeyroos left for New Zealand on Tuesday for a three match test series against the Black Sticks. Their first game is today at 1pm. Tune in to hockeynz.co.nz if you want to watch the game. – In the lead up to the G20 Summit in Brisbane this week, President of the International Netball Federation, Molly Rhone has said that netball was empowering women and girls from around the world. Ms Rhone used the opportunity to highlight that netball was more than just a sport. She said it was something that could provided opportunities for women to interact outside of their family where that opportunity is usually limited or non-existent. She went on to say that the increase of competition in Australia, New Zealand and England was providing a gateway for the sport to take off in developing countries.